An unknown 18th century shipwreck with guns onboard has been found outside Helsinki in the Gulf of Finland, at over 60 meters depth. The wreck remarkably well preserved. 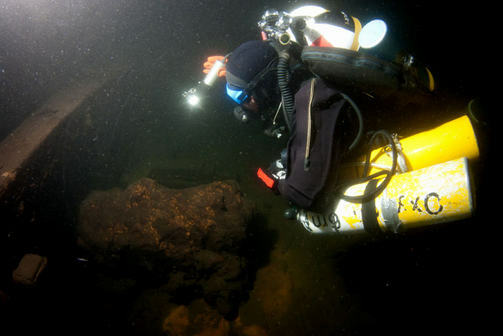 A target resembling a shipwreck was discovered during the Finnish Maritime Administration’s routine seabed surveys in the Gulf of Finland in 2003. Originally the finding was suspected to be a merchant vessel with limited significance, but the initial underwater documentation undertaken by Finnish wreck research team Badewanne revealed that the discovery was much more interesting than originally thought. The wreck site has been documented by Badewanne since summer 2004, with a research permit from the Finnish National Board of Antiquities. Mixed gas diving techniques, involving breathing of helium-oxygen mixtures, have been used in the work due to depth in excess of 60 meters at the wreck site. The wreck site has been documented using digital still and video cameras, and the research results are slowly lifting the curtain of secrecy covering the mystery wreck. The wreck has 12 gun ports on one deck, with six guns still present in their original positions. In addition to deck guns, other details lying on the deck include remains of ropes, buckets, remains of a steering wheel and stock of a rifle. Ship’s figurehead, a man figure, is lying on the seabed, just under the bow. Hatchways on gun deck are open, and remains of a barrel and pieces of wood are visible in the silt underneath them. The documentation work by wreck research team Badewanne has been completely non-intrusive, utmost care has been taken to protect this pristine discovery. Despite research effort, the ship’s identity remains a mystery. 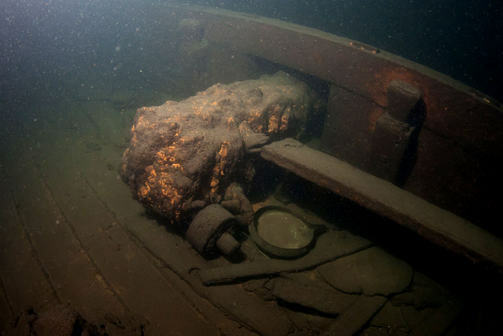 Ship’s bell is still in its place, and if raised and preserved, it might eventually reveal the wreck’s identity. But at this stage the Finnish National Board of Antiquities is not planning a lifting operation. Because the accurate identity is missing, the team Badewanne has given the wreck a code name “Donald Duck wreck”, as its general appearance is similar to the way ship wrecks are usually illustrated in Donald Duck comic strips. “The unique environmental conditions of the Baltic Sea, i.e. low salinity, constantly low temperature and darkness at depth hinder or slow down biological, microbiological and biochemical decaying processes, have all helped to preserve not only this wreck, but also countless others! 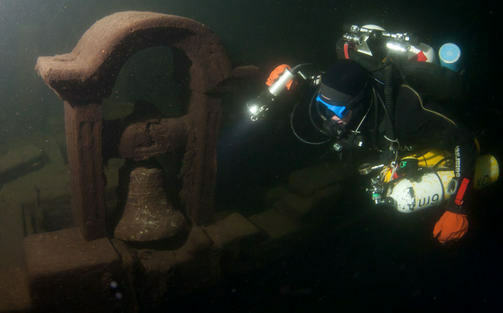 These include the Dutch merchantman Vrouw Maria – another 18th century wreck which has captured wide international interest after its discovery in 1999 in Finnish waters”, says Juha Flinkman, underwater cameraman in wreck research team Badewanne, as well as a marine scientist working at Marine Research Center in Finnish Environment Institute. This is what its all about! Its fantastic to still be discovering these amazing historic wreck sites globally. Good luck with the ID on the ship, I just hope that we can get more divers visiting the site. Something as awesome as that deserves to be seen, experienced and enjoyed by people! This is the reason why we dive! Nice pictures! I appreciate how hard it is to take good pictures in challenging conditions. Looking forward to knowing the real identity of the D/Duck Ship.